The moor’s edge will be marked by a cattle grid, and to its left or right a latched five-bar gate for horses and livestock. Step across the grate, mind your ankles, and you’re in the moor world: the grate is a frontier, and after those seconds of eyes-down attention as you tread from rung to rung, you look up to find yourself somewhere new. I’d left Lynton, which overlooks the sea on the northern edge of Exmoor, before eight that morning. The track that took me up through the peripheral gorse-land of Thornworthy Common was a streambed, rushing louder as I climbed, and with a stream’s topology – water weed and bubbling falls and water-smoothed cobs. Water, too, is drawn to the routes of easiest passage. Here and there, clots of off-white foam had collected, and were being picked away at by the wind. There was a moment when it went as dark as dusk or eclipse. Amidst the gorse, the joyless Exmoor ponies. They did not mind the rain. The end of the farmed land was marked by a neat bank faced with plates of sandstone, and then a field that was light green at its lower edge but bearded with rushes as it rose towards the moor. Here the moor’s persistence was visible: the cultivated land – the so-called reclaimed land – was being claimed back by the moor. It was as if the farmer had relinquished it, a kind of peace offering. The moor ahead of me was a foaming, surging mass, a sponge squeezing itself, a waterlogged lung. I could feel its spume coming down on me, hear its roar. The track petered out into a handful of deep-cut trenches that ramified further until all that was left was a shorn expanse of dirty turf, and then, there, by the gate to the moor, was the lumpen sandstone artefact known as the Saddle Stone, which marked the boundary of the old Royal Forest. Beside it was a line of ravaged beeches, canted towards the high moor as if at once nodding the way and bowing a fretful farewell. Like everything here that is not pure moorland, the beeches are the Knight family’s doing (the estate’s accounts for 1850: ‘BEECHNUTS: £16’) and it is the beeches that shepherd you onto the moor, and guide you off it. The drizzle became first a spray, then a fine mist. The mist thickened. There is no question when the moor proper has been reached: you know it like a cold breath on the nape – the ground becomes tussocked and sopping. The place is at once underfoot and on the horizon. Patches of green-red sphagnum marked the ‘featherbeds’, and here they were no bigger than a double bed; but who knew how deep. It is in an Exmoor bog, ‘as black as death and bubbling’, that Carver, the villain of Lorna Doone, drowns. ‘The black dog had him by the feet; the sucking of the ground drew on him, like the thirsty lips of death . . .’ And so he sinks, like Stapleton in The Hound of the Baskervilles, into ‘the engulfing grave of slime’. A rendering to the underworld. The gorse and heather had not come this far; here was a treeless land of purple moor-grass and mat-grass and cotton-grass and rush, and low-lying sphagnums and liverworts. The mist, secretly, had become fog, a deadening vapour that surged with the wind and seemed a presence as constant and primary as the peat underfoot. It was water with a rinsing of soap, an occlusion rather than a blinding. My cough sounded like an animal’s – in these conditions a noise lasts no longer than its cause. In Lorna Doone, when the fog came down, ‘it was dismal as well as dangerous now for any man to go fowling . . . the pan of the gun was reeking, and . . . the sound of the piece was so dead, that the shooter feared harm and glanced over his shoulder’. There was something about the fog that meant that its movement was most visible at the periphery of your vision, just as ghosts are said to be discernible only out of the corner of the eye. Soon I was lost, but it was the comic disorientation that happens before true confoundment blooms. I knew where I was. Here, on the map, east of the Chains and west of Woodbarrow Hangings and north of the cairns that crest the hillside above Challacombe, and so I walked south, expecting to come to a rise, but coming instead to a descent, and then the path was lost, and the fog was so thick that it seemed to muffle even the sound of my breathing. It had a density that instinct told me must be suffocating, but of course it was experienced only as a chill in the mouth and in the lungs and in the eyes. Approaching the Chains, I began to understand that the old topographers’ use of the word ‘black’ to describe the moors – ‘black desart’, ‘black-a-more’ – was not metaphor: black it is, and the place names, too: Blackpits, Blackford, Blackland. The sodden heather, the rush, the burnt gorse, the dead bracken; above all, the exposed peat. Where drainage ditches had been cut, the peat’s profile was exposed: dark brown and knitted with rootlets at the surface, a fibrous velvet below, and darkening and distilling as it deepened to the blackest jelly at the cutting’s floor. The Chains is Exmoor at its wettest. Off the path, every other step turns a foot or puts it calf-deep in the land. The drizzle teemed across the moor, noisy on waterproofs and like the wave-slap of an angry sea on the windward cheek. Out of the mist ahead emerged what appeared to be a breach in the hillside, a bite taken out of it from above, white sky or sea beyond; and yet the coast, I knew, was five miles away, and to the north. What I was looking at could only be sky if the world had been upended. As I approached, I saw that the lip of the breach was fringed with grass that seemed to float inches above the broken ground. It was pond-rush. The water was a white-grey indistinguishable from the sky, as if this pond were the fog’s cauldron. You might wade into it and emerge no wetter; duck beneath the surface and continue to breathe. There were no ponies in its vicinity, nor any waterfowl. 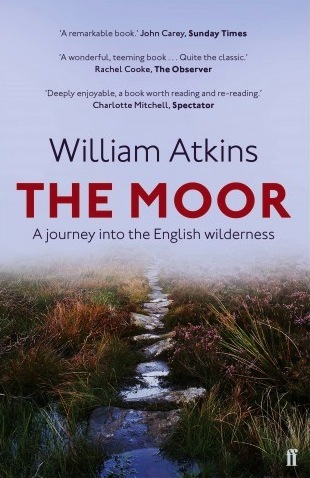 The Moor: A journey into the English wilderness by William Atkins, which was short-listed for this year’s Thwaites Wainwright Prize for nature- and travel writing, is published by Faber & Faber at £9.99 in paperback. For more about William Atkins’s work, see his website. He can also be found on Twitter: @WillAtkins01.